I interviewed Dawne McCance in fall of 2011 about her book, Derrida on Religion: Thinker of Differance (Equinox Publishing, 2008). She suggested several avenues for connecting Derrida’s work to contemporary conversations going on now in the humanities around disciplinarity, religion, ethics, and critical animal studies. A Distinguished Professor of Religion at the University of Manitoba, her new book, Critical Animal Studies: An Introduction is forthcoming from SUNY. Donovan Schaefer: You mention by name many of the philosophers Derrida was in conversation with in his work: Plato and Aristotle, Kant, Hegel, Marx, Nietzsche, Husserl, Heidegger, Merleau-Ponty, Levinas, Levi-Strauss, Gadamer, de Man, Searle, Habermas, and others. Where do you see Derrida’s points of contact with the study of religion? 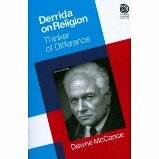 Dawne McCance: In this book what I attempt to unfold, at least in part, are some of Derrida’s “points of contact” with the study of religion. More than that, however, my purpose in the book is to introduce students and scholars of religion to Derrida’s work overall, so as to allow them to discern these “points of contact” for themselves. As you note in your question, Derrida engages the work of canonical thinkers in the Western tradition, from Plato, let’s say, to Habermas. Only relatively recently during the modern period, have these thinkers been assigned to either philosophy or religion, one as distinct from the other, a division which is not easy to uphold when it comes to Derrida’s work, in particular his work (in Rogues, and in The Beast and the Sovereign, Volumes I and II) on democracy’s theological-philosophical-political foundations. I do not set out in the book to delineate or defend disciplinary divisions, but rather to consider the work of thinkers such as Nietzsche, Heidegger, Meleau-Ponty, Levinas, Gadamer, and Habermas, among others, as essential to scholars of religion, as much as to scholars of philosophy and/or literary criticism. DOS: What regions of our field right now do you think would benefit from revisiting Derrida’s work on religion? DM: From the many ways your question might be answered, I will select only two. The first pertains to how religion is and might be taught. Here, I am thinking, for instance, of Derrida’s last seminar, The Beast and the Sovereign (Chicago, 2009); and in addition to this, I am thinking of his next-to-last seminar on the death penalty, which Peggy Kamuf is now translating. Derrida approaches Christianity in particular as providing the theoretical-philosophical foundations for contemporary thinking of sovereignty (of the self and of the nation-state) and of the sovereign’s right to life and death of the other. I am interested in this work as suggestive of an approach to teaching religion. Secondly, Derrida’s work on animality and “the animal” question has yet to be taken in the study of religion, although I consider it a profound importance for the contemporary rethinking of ethics, particularly animal ethics. DOS: The “Key Thinkers” series is designed in part to produce teachable books on complex thinkers. Do you teach Derrida to undergraduates in religion classes? What resistances and openings do you find in doing so? DM: Yes, I teach Derrida in undergraduate religion classes – not only Derrida, but, depending on the course in question, a number of other philosophers, as well as literary, religious, critical, ethical, and architectural theorists, and so on. I am not persuaded that my responsibility as a teacher is to define and defend disciplinary boundaries – or boundaries of other sorts either (although I want students to study the history of these boundary formations) – so much as to invite students to consider certain religious (philosophical, ethical, theoretical) issues, to open them to available resources pertaining to these issues, and to encourage them to think critically. I am privileged to be working in a Department of Religion that considers “theory” to be essential from the introductory to the doctoral level, and that, as one of its streams, offers a PhD in theory. DOS: Going back to the world religions question: do you think we are we at risk, in using the world religions framework (even with Derrida), of recreating something like the conditions on the island of Capri that you describe taking place in the 1994 conference where “Faith and Knowledge” was delivered, where the assembled experts on religion represent a very limited swathe of the religious diversity of the world? Is Derrida too Eurocentric to help us overcome this? DM: As you will recall, it was the Eurocentric, particularly patriarchal Judeo-Christian representation that Derrida called into question at the isle of Capri gathering. While he did not presume to have expertise in religion, in non-Western religions especially, he was consistently mindful of the need to open “world religions” to traditions beyond the (primarily Christian) West. DOS: Derrida in his late writings identifies himself as an “animalist” philosopher, and I was grateful to see that you mention Derrida’s work on animality and species several times in this book. Do you find some significance in his critique of species boundaries for the study of religion? DM: Yes, I find Derrida’s work on “the animal” question to be crucial, not only because it critiques, throughout the tradition of Western metaphysics, the determination of human/animal difference on the basis of animal lack or incapacity, “the” animal’s lack of the “can have [pouvoir-avoir] of the logos,” as he puts it in The Animal That Therefore I Am (Fordham, 2008), but also because, as I think Derrida points out, ethics, including animal ethics, cannot be reduced to a prescriptive calculus that recognizes moral worth simply by assessing the extent to which human or nonhuman animals are “like us.” In the ethical approaches that prevail in contemporary critical animal studies, the ethicist takes himself (the “mentally normal” adult human male) to be both author and norm, an idea that is not compatible with ethics as Derrida’s understands it. DOS: By design, Derrida writes in complex thought-phrases that deflect the satisfaction of compact or accessible answers. Your book is slim, but feels almost unbelievably rich in the way it braids together different textures from his work while keeping their density intact. I have to feel like there was a conscious strategy behind that. How did you go about simplifying that which so ardently resists simplification? DM: I am suspicious of “simplification” as of the idea that Derrida’s work is to be resisted because it is “difficult.” We are living in difficult times, where answers are not always readily available; and where, for instance, the unprecedented human subjection of animals is radically changing material conditions for life on this planet. I have had the privilege of studying Derrida’s work for a number of years, and although I still regard myself as a novice in this respect, I may have gained enough sense of his writing overall to enable others to enter his oeuvre, and to begin to appreciate his remarkable initiatives. I take his work seriously as enabling readers to engage some of the difficult questions of our day, and hopefully, to move through them. This entry was posted in Academy, Donovan Schaefer, Interviews, Religion and Theory, Theory and Method and tagged animals, critical animal stuides, Derrida, ethics, Religion, theory and method in religious studies. Bookmark the permalink.